I haven’t cried while reading a picture book in quite some time. But LUBNA AND PEBBLE, a tender new children’s book about refugees written by Wendy Meddour and illustrated by Daniel Egneus, was so moving and poignant that tears spilled onto my cheeks as I turned the final page. LUBNA AND PEBBLE is a stunning story about the refugee experience — specifically, a portrait of life as a child refugee — that is as harrowing as it is beautiful. It is an ode to the power of good deeds, friendship and a compassionate, kind heart. Why Read LUBNA AND PEBBLE? In LUBNA AND PEBBLE, Lubna’s best friend is a pebble, found the night she landed in a World of Tents with her father. Pebble smiles at her when she is scared, and as long as Pebble and her dad are with her, Lubna knows she is safe. Pebble, simply put, is Lubna’s confidante - the only one she has to talk with besides her father. Then a little boy arrives to the World of Tents, and he is lost, cold and numb. Lubna introduces the boy to Pebble, and the two become friends in their new, uncertain world. One day, however, Lubna’s father announces good news — they have a new home! Thus, they will be leaving the World of Tents — and when it comes time to say goodbye to Amir, Lubna leaves him with the most precious, perfect gift. LUBNA AND PEBBLE is an Absolute Must Have Children’s Book About Refugees — One Every Child Everywhere Should Read! LUBNA AND PEBBLE is an absolute must read. It is one of those special stories that will undoubtedly spark conversation with your kids and students. The dream-like illustrations perfectly encapsulate the uncertainty inherent in Lubna’s refugee experience, yet the tenderness they convey encourages children to feel empathy as they learn about Lubna’s displacement, and awe as they watch Lubna give away the one possession she cherishes most. LUBNA AND PEBBLE is the kind of story that teaches and enlightens with the very first read, one that will offer comfort to the multitude of children who have lived Lubna’s experience and nurture empathy in those who have little prior understanding of what it means to be a refugee — to leave your home, your friends, and settle in temporary housing, often tents, while your parents struggle to find a real place to live. And, of course, it is a story of giving, about the power of one act of generosity, and the manner in which one seemingly tiny action can single handedly change a life. Written and illustrated with the lightest touch, this book is perfect for kindergarten on up. LUBNA AND PEBBLE can be used as a springboard for so many different activities at home or in your classroom! It will seamlessly begin a discussion about the harrowing refugee experience, one that can easily incorporate K-W-L charts, Padlet boards or something similar in which children can highlight the many similarities they share with refugees despite distance and circumstances separating us. It can easily spark a conversation about the meaning of loss and, subsequently, the creation of an object that will bring us security, comfort and courage during frightening times. It can lead to a random acts of kindness train, illuminating the manner in which a single compassionate gesture can escalate and spiral until it positively affects the days and weeks of the people in our schools, neighborhoods and communities. Finally, it can be read to kick off a community service activity in which children can create welcome bags or something similar for refugees in their communities or states. Overall, LUBNA AND PEBBLE is a stunning testament to the power of companionship to guide us during troubling times. Set in a situation so different than the one lived by many children who are likely to read this book, it offers a window into a different world — yet one that has universally relatable and resonant themes that will have children pondering their own connection to their homes, families and friends long after the final pages are turned. 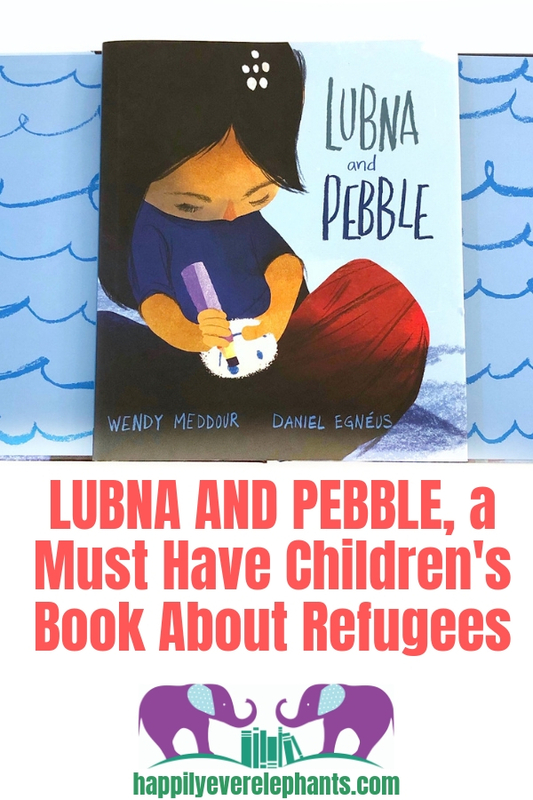 DID YOU LIKE THIS POST ABOUT LUBNA AND PEBBLE, A PHENOMENAL CHILDREN’S BOOK ABOUT REFUGEES? WE THINK YOU WILL LOVE THESE, TOO!